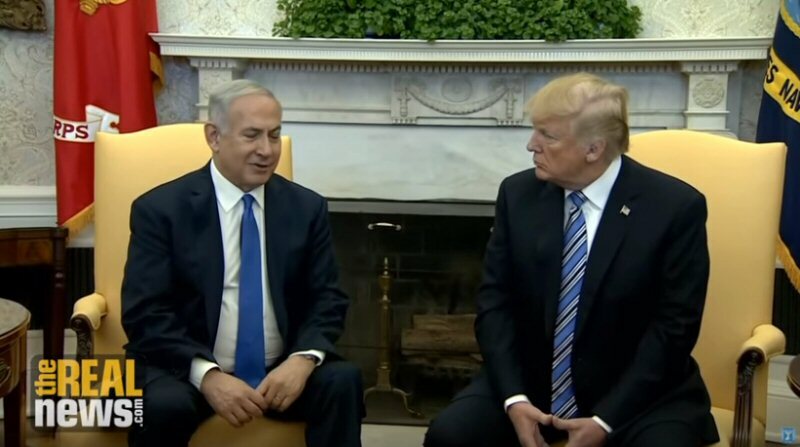 Israeli Prime Minister Benjamin Netanyahu has a long history of crying wolf over supposed nuclear weapons in Iran and Iraq – Ben Norton reports. BENJAMIN NETANYAHU: There is no question whatsoever that Saddam is seeking and is working and is advancing towards the development of nuclear weapons. No question whatsoever. If you take out Saddam, Saddam’s regime, I guarantee you that it will have enormous positive reverberations on the region. BEN NORTON: Israel’s extreme right-wing Prime Minister Benjamin Netanyahu has a habit of repeatedly claiming without any evidence that his enemies supposedly have weapons of mass destruction. But a look at some of Netanyahu’s public speaking over the past 30 years shows that he has a long history of crying wolf.In a dramatic speech on April 30, Netanyahu used stage props and a cartoonish PowerPoint presentation to falsely claim that Iran had a secret nuclear weapons program and that it had been concealing. BENJAMIN NETANYAHU: Tonight we are going to reveal new and conclusive proof of the secret nuclear weapons program that Iran has been hiding for years from the international community in its secret atomic archive. We’re going to show you Iran’s secret nuclear files. BEN NORTON: Netanyahu’s speech had a clear political purpose: to sabotage the Iran nuclear deal agreed to by the international community with false and misleading allegations. BENJAMIN NETANYAHU: Well, tonight I’m here to tell you one thing: Iran lied. Big time. After signing the nuclear deal in 2015, Iran intensified its efforts to hide its secret nuclear files. BEN NORTON: Numerous nuclear experts, including Robert Kelley, the former inspector for the International Atomic Energy Agency, said Netanyahu’s claims were completely bogus. BENJAMIN NETANYAHU: I thought many of the things that he presented were very childish. I would think that a country like Israel that has its own nuclear weapons, and has scientists who must be pretty competent, would be able to look at the information we were shown and say right away , well, this is garbage. He presented very early in the presentation a drawing which was supposed to be an illustration of a nuclear device. And you look at that drawing, it’s a cartoon, it’s a joke. You look at this and you see it it’s completely amateurish, completely childish, and trying to make something very important out of something that’s not important at all. BEN NORTON: The Israeli prime minister made a similarly cartoonish speech at the United Nations General Assembly in 2012. The performance was another thinly-disguised call for war in which Netanyahu infamously drew a red line, and claimed Iran was mere months from procuring a nuclear warhead. BENJAMIN NETANYAHU: By next spring, at most by next summer, at current enrichment rates, they will have finished the medium enrichment and move on to the final stage. From there it’s only a few months, possibly a few weeks, before they get enough enriched uranium for the first bomb. A red line should be drawn right here, before, before Iran completes the second stage of nuclear enrichment necessary to make a bomb. BENJAMIN NETANYAHU: The question is, really, how do we ensure that these weapons of destruction these missiles, these chemical weapons, the nuclear program that is fast accelerating in Iraq, that these do not pose a threat in the aftermath of the crisis, assuming, assuming it gets out of Kuwait? This is an issue for the entire international community. BEN NORTON: Netanyahu’s weapons of mass destruction lies were even more extreme a decade later. In the lead up to the war in Iraq, Benjamin Netanyahu testified before the U.S. Congress, and claimed there was no question whatsoever about Saddam Hussein’s supposed weapons of mass destruction. BENJAMIN NETANYAHU: There is no question whatsoever that Saddam is seeking and is working and is advancing towards the development of nuclear weapons. No question whatsoever. And there was no question that once he acquires it, history shifts immediately. There is no question that he had not given up on his nuclear program. None whatsoever. There is also no question that he was not satisfied with the arsenal of chemical and biological weapons that he had, and was trying to perfect them constantly. Saddam is hellbent on achieving atomic bombs, atomic capabilities as soon as he can. BEN NORTON: In this September 2002 congressional hearing, Netanyahu openly called for war on Iraq and insisted that a U.S. military invasion would be hugely beneficial for the entire Middle East. BENJAMIN NETANYAHU: If you take out Saddam, Saddam’s regime, I guarantee you that it will have enormous positive reverberations on the region. And I think that people sitting right next door in Iran, young people, and many others, will say the time of such regimes, of such despots, is gone. There is a new age, something new is happening. BEN NORTON: In reality, the catastrophic and illegal U.S.-led war and occupation in Iraq set the region ablaze, destabilizing numerous countries leading to the deaths of more than 1 million people, fueling extremist Salafi jihadist groups like al Qaeda, and eventually giving birth to ISIS. But, Netanyahu was an absolutist. He declared that there was no other option but to dismantle the government in Baghdad. BENJAMIN NETANYAHU: Two decades ago it was possible to thwart Saddam’s nuclear ambitions by bombing a single installation. But today nothing less than dismantling his regime will do, because Saddam’s nuclear program has fundamentally changed in those two decades. He no longer needs one large reactor to produce the deadly material necessary for atomic bombs. He could produce it in centrifuges the size of washing machines that can be hidden throughout the country. And I want to remind you that Iraq is a very big country. BEN NORTON: Yet, Netanyahu’s lies didn’t stop there. He also said the same of Iran and Libya. BENJAMIN NETANYAHU: The two nations that are vying, competing with each other, who will be the first to achieve nuclear weapons, is Iraq and Iran. And iran, by the way, is also outpacing Iraq in the development of ballistic missile systems that they hope will reach the Eastern seaboard of the United States within 15 years. Now, the question is what’s your next step, knowing that three of these nations are developing nuclear weapons? This is not a hypothesis. It is fact. Iraq, Iran, and Libya are racing to develop nuclear weapons. BEN NORTON: And it was not just in Iraq where Netanyahu forcefully called for regime change. He also proposed toppling the government in Iran. BENJAMIN NETANYAHU: Obviously we’d like to see a regime change, at least I would, in Iran, just as I would like to see in Iraq. The question now is a practical question. What is the best place to proceed? It’s not a question of whether Iraq’s regime should be taken out, but when should it be taken out? It’s not a question of whether you’d like to see a regime change in Iran, but how to achieve it. The application of power is the most important thing in winning the war on terrorism. The more victories you amass, the easier the next victory becomes. The first victory in Afghanistan makes a second victory in Iraq that much easier. The second victory in Iraq will make the third victory that much easier, too. BEN NORTON: Benjamin Netanyahu insist e d that the United States did not need approval from the international community to wage war on Iraq. BENJAMIN NETANYAHU: And equally immaterial in my mind is the argument that America cannot oust Saddam without prior approval of the international community. Today the United States must destroy the same regime, because a nuclear-armed Saddam will place the security of our entire world at risk. And make no mistake about it, if and once Saddam has nuclear weapons, the terror network will have nuclear weapons. And once the terror network has nuclear weapons it is only a matter of time before those weapons will be used. BEN NORTON: In addition to his false claims of WMDs, Netanyahu also tried, without any evidence, to link the Iraqi government to not just al Qaeda, but also the Taliban, the extremist Islamist group in Afghanistan. JOHN TIERNEY: You’re making a connection between the Taliban in Iraq. BENJAMIN NETANYAHU: Yes, I am. I’m saying that the, if you look at those who harbor terrorists, and those who support terrorists, and-. JOHN TIERNEY: I guess I was looking for a connection between September 11, and my understanding why we went to the Taliban is it was a connection there, they were harboring somebody that we believed did the act of September 11. BENJAMIN NETANYAHU: Yes, that’s the first reason why you did it, and-. JOHN TIERNEY: Now you’re going to take me from September 11 to Iraq, somehow? BENJAMIN NETANYAHU: Yes, but I’m saying something else. I’m saying the connection is not whether Iraq was directly connected to September 11, but how do you prevent the next September 11? BEN NORTON: In response to critics who pointed out the lack of evidence for these extraordinary allegations, Netanyahu maintained that foolproof evidence was not even necessary. BENJAMIN NETANYAHU: And to the various critics, especially overseas, believe that a clear connection between Saddam and September 11 must be established before we have a right to prevent the next September 11, well, I think not. BEN NORTON: Whether it’s 1990, 2002, or 2018, it’s clear that Netanyahu is still repeating the same refrain: investigations don’t work, diplomacy is a dead end, and evidence is not necessary. The only path that can and should be pursued is more war. And Israel’s longest serving prime minister has more than demonstrated his willingness to tell a few lies to sell those wars to the public.Reporting for The Real News, I’m Ben Norton.